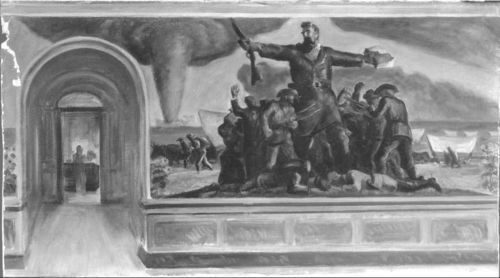 This black and white photograph shows the preliminary sketch for the statehouse mural entitled "Tragic Prelude" by Regionalist artist John Steuart Curry, (1897-1946). Located on the north wall on the second-floor of the capitol in Topeka, Kansas, the mural illustrates abolitionist John Brown holding a bible and a Beecher Bible rifle. At Brown's feet, two slain soldiers from the North and South are symbolic of the struggle during the Civil War. In the background, pioneers with their wagons are heading west as raging prairie fires and destructive tornadoes move over the prairie. The mural's dimensions are 31 feet long and 11 1/2 feet high and it is painted with oil and egg tempura paint.